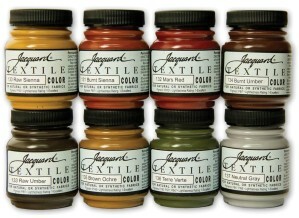 Textile Colors can be applied straight from the bottle with a brush, applicator bottle or stamp. The colour is intense and semi-opaque. When diluted with water or Colorless Extender they produce beautiful transparencies. These colours leave your fabric as soft as possible. Heatfix and colourfast on natural or synthetic fabrics, and can also be used on leather, wood and paper. Pack contains full-size 70ml bottles of Raw Sienna, Burnt Sienna, Mars Red, Raw Umber, Burnt Umber, Brown Ochre, Terre Verte and Natural Gray.